EOU’s main campus is located in La Grande, Ore., on I-84, 259 miles east of Portland and 177 miles west of Boise, Idaho. Click here if you are interested in scheduling a campus visit with our Admissions Office! EOU's administration building was built in 1929 and is home to primary student services including Admissions, Financial Aid, Student Accounts, the Registrar and President's Office. Need a quick snack or espresso? Head to Mac's Grill or the full service dining hall. Hoke is also home to “The Voice” student newspaper, along with Student Activities, the Multicultural Student Center, Bookstore and Outdoor Program. Mountaineer teams practice and play in two gymnasiums, while fitness equipment and a climbing wall are available for students, faculty, staff and community members to use. Take in a play or enjoy an evening of music in McKenzie or Schwarz theaters. Nightingale Gallery is also inside, with exhibitions throughout the year. Upstairs you'll find the Learning Center and Disabilities Services. This former elementary school is now home to the Social Sciences and Modern Languages departments. The Alumni Room provides meeting and event space and Eastern Oregon Head Start is also located here. The main Mountaineer football stadium is complete with concessions, additional seating and press boxes. Commencement ceremonies draw several thousand people to the stands each June. 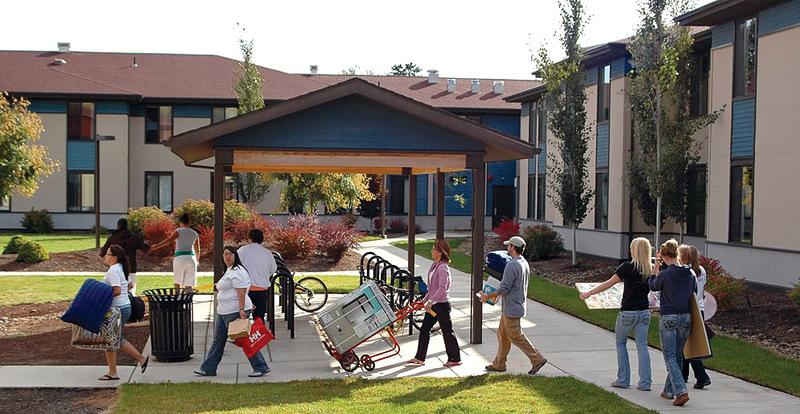 EOU's newest residence halls were built in 2005 and provide housing for 270 students. Buildings surround an inner courtyard with plenty of green space and a sculpture installation titled "La Grande Weir." EOU’s apartment-style housing is reserved primarily for juniors, seniors and students over 21. Each furnished suite accommodates four residents in single rooms and includes two bathrooms, living room and kitchen. Spread out in the window-walled reading lounge, settle in at the coffee bar or find a private study nook to get work done. EOU’s 21st century learning center is the intellectual heart of campus. Home to the Colleges of Business and Education, Zabel Hall features informal learning spaces, a computer lab overlooking campus, student commons, lecture hall and an open-air courtyard. General medical and wellness checkups are free at the Student Health and Counseling Center, no insurance needed. Enrollment in six or more credits with at least one on campus credit is the only requirement. Nestled between the Blue Mountains and the Eagle Cap Wilderness is the Grande Ronde Valley. Everything from mountain biking, rafting, skiing and more is accessible from EOU’s front door! Communities in the Grande Ronde Valley include La Grande, Cove, Union, Imbler and Elgin. The total population is 24,961. The closest major cities are (1) Boise, Idaho, 174 miles (2) Portland, 260 miles, and (3) Spokane, Wash., 255 miles. Fertile farmland and wetlands supporting a variety of wildlife make the valley a desirable location to live and go to school. The Grande Ronde, Wallowa and Minam rivers are great places to spend an afternoon fishing, rafting, exploring or just relaxing and taking a break from work or studies. The majestic mountain ranges near EOU’s campus are part of the Wallowa-Whitman National Forest. From November through April, the Elkhorns become a winter wonderland for backcountry skiing, snowshoeing and snowboarding. Anthony Lakes in the Elkhorns is 45-miles south of EOU. It's the highest base elevation ski area in the state! An equally short drive to the north is the Spout Springs Ski Resort, and a nordic ski area at Meacham Divide is just 19 miles west of La Grande. The Elkhorn Mountains with lingering snowcaps as seen from the Grande Ronde Valley. During the summer, this same recreation area provides great camping, canoeing, wildlife viewing and even berry picking! Rock climbing is a popular sport and there are numerous routes in the area ranging from beginning to advanced skill levels. EOU also has an indoor climbing wall that is open to the community. The Painted Hills of the John Day Fossil Beds National Monument form a colorful, almost otherworldly landscape. Nearby Mountain biking and hiking trails yield 360-degree views of beautiful Morgan Lake above La Grande. EOU's campus is a short walk from coffee shops, eateries and art galleries that provide cultural experiences and places for students to gather. La Grande's seasonal, open air farmers market provides students and the community great options to purchase fresh produce, handmade jewelry and other arts and crafts.